The Day of the Crimean Tatar flag in Kyiv, saturated with events, ended with a rally in the central square of the Ukrainian capital. The general meeting on the Independence Square began with the joint performing of the national anthem of the Crimean Tatars and the national anthem of Ukraine, QHA correspondent reported. Despite the rainy weather, the patriotic action was attended by representatives of the Crimean Tatar people, and the people of other nationalities as well, who specially came to support the Crimean Tatars on this important day. Chairman of the Mejlis of the Crimean Tatar people Refat Chubarov addressed the participants of the rally and thanked those present for the active position and support, and also greeted all his compatriots in his native Crimea and diasporas of the Crimean Tatars around the world. "The Crimean Tatar national flag is recognized all over the world, and it is associated with the resistance of the Crimean Tatars in the occupied Crimea," he said. In his speech Chubarov emphasized that despite the criticism of the slogan "Two flags - one country", Ukrainians and Crimean Tatars are loyal friends, and therefore, Crimean Tatar flag will always be raised along with the flag of Ukraine. “For us, one of them is a state flag, and the other one is national,” he said. The Head of the Mejlis went on saying that Crimean Tatars are holding various solemn events in Crimea today. Children from the "Kırım Ailesi" recited patriotic poems about the Crimea and the national banner. Kharkiv deputy Oleg Ovsienko came with a gift for the Crimean Tatars - he brought a large wicker tamga. 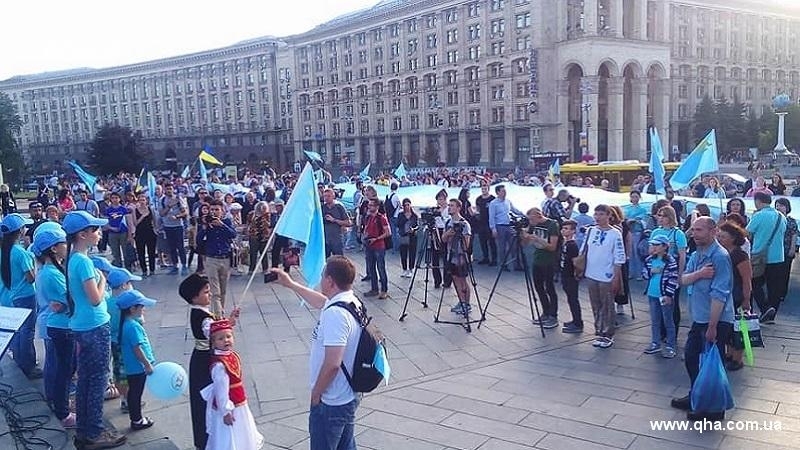 Many Kyiv residents noted the symbolism of holding such an event in the capital, since on this day the whole Ukraine can express solidarity with the fraternal Crimean Tatar people. The holiday has come to the end, but for the Crimean Tatars the national flag always remains a symbol of unity, freedom and resistance. Before the occupation by the Russian Federation in the Crimea on June 26, various mass events, contests and sports competitions were held annually, with thousands of participants. In the past three years, the main events dedicated to the Day of the Crimean Tatar Flag are held on the mainland of Ukraine with the efforts of public organizations under the coordination of the Mejlis of the Crimean Tatar people. For the first time, the Crimean Tatars celebrated the National Flag Day in 2010. In the same year on June 26 at the fifth Kurultay a decision was taken to celebrate this day annually as the Day of the Crimean Tatar flag.